A smart phone in your pocket is great for on the go news, web browsing, and—of course—mobile gaming. It’s also fantastic for comparison shopping. Today we take a look at four Android scanners and price comparison engines. It’s quite a neat time to be a consumer. Historically if you wanted to do serious price comparisons you had to haul yourself around town, gather flyers from the newspapers, and otherwise invest way too much energy into potential savings that might not even break into double digits. Now you can comparison shop with an ease that borders on magic: by simply pulling out your smart phone and scanning the barcode or typing in the name of the item you wish to compare. Today we’re taking a look at some of the more popular and powerful barcode scanners and price comparison engines available for the Android platform. Before we get to that, a word on our methodology. To test the barcode scanners and the resulting search results we wandered around and rounded up some relatively random items from around the How-To Geek offices. This included a children’s graphic novel, a Wii game, a board game, a pack of razors, a box of tea, and a bottle of nail polish. It’s a decent spread of consumer items that covers several genres. For each application we scanned all the items, looked for the best price at the time, and noted any other relevant benefits of using one scanner over another. It’s worth noting that our primary focus was on the speed and ease of use. You may find that certain scanners have specific features that best suit your needs. What we focused on was how fast you could scan, compare prices, and purchase items if you desired. Since all the scanners are free-as-in-beer, feel free to download them all and run your own tests to confirm our conclusions. 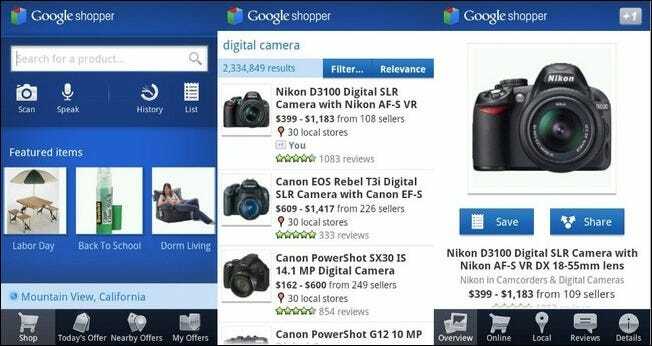 Google Shopper taps directly into Google’s massive price comparison engine. You can search via text entry, barcode scan, or voice entry. It also includes location-aware coupons and discounts (if you’re into opt-in advertisement in the name of saving money). Within Google Shopper you can check your search history, star items you’d like to revisit later, and sort the items by relevance and price. Barcode scanning is insanely fast, so fast it’s almost aggressive actually. We had all the items lined up on a countertop and ready to scan; several times simply lifting the phone to point the scanner at an item on the table would cause Google Shopper’s scanner to snag a barcode on the way into position. It’s neat that it’s so sensitive and scans so fast, but it was so good it was actually frustrating at moments. That said the barcode scanning was spot on and it didn’t fail to lookup any of the items we threw at it. The voice recognition feature was a mixed bag. It absolutely could not pick up the name of the graphic novel “Zita the Spacegirl” but it had no problem with the French-named game Carcassonne or the box of Peppermint Celestial Tea. Verdict: Google Shopper is snappy on the scan, quick to look items up, and gives you access to the same broad search results you’d get if you were sitting at your computer using Google to do your shopping. The only complain we can lodge about the application is that there seemed to be a unreasonable number of screens to click through. While we appreciate that it confirms that the item we scanned is indeed the item it found, it was annoying to constantly confirm and then click through to the actual price lists. 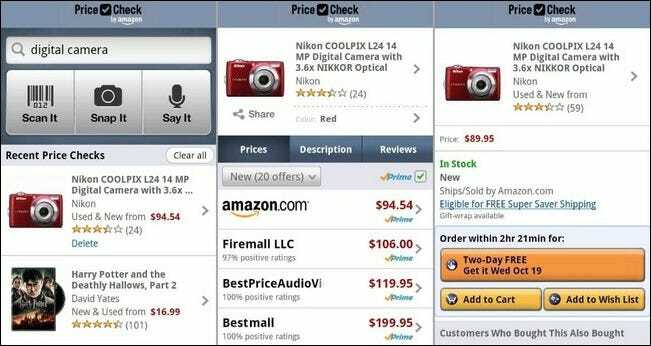 Right out of the gate we need to clarify: Price Check is not the same as Amazon’s default Android application. Although Amazon’s default application has a barcode scanner in it, Price Check is a new release from Amazon that builds on their already solid scanner with new features. If you’re doing a lot of price checking it’s more user friendly than the scanner in the Amazon app as it gets you to the scanning and checking section faster and with cleaner and larger icons. Amazon only searches the Amazon.com eco-system; the system has grown exponentially over the years and pulls in data from a wide range of merchants. We had no problem finding the products at reasonable prices (and often with free Super Saver or Prime shipping). The one exception was the packet of razors—Amazon found the brand accurately but reported none in stock and no price for comparison. The barcode scanner was functional but quite slow compared to the lightening fast scanner in Google Shopper. Like Google’s star feature, Amazon has the Wish List system so you can easily save items for later review (one could easily argue Amazon’s wish list system is superior in that you can easily share it with others). In addition to the barcode scanner you can also speak your search query and type it in (we found the speech function to be just as fuzzy in this app as it was in Google Shopper, no surprise seeing as how it’s using the same underlying functionality provided by the phone). Price Check also has a phone-based search feature. Snap a photo of a book, dvd, game, or other media with a cover, and you can search for it on Amazon. It’s like a very limited version of Google Goggles (interestingly, there is no equivalent function in Google Shopper). Verdict: If you’re in the Amazon eco-system already (especially if you’re a Prime member) the scanner is quite useful. 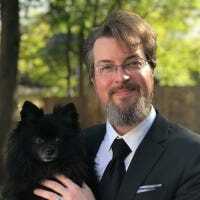 If you’re not already actively using Amazon as a primary shopping location it doesn’t help you much in the way of speeding up the purchasing process or comparing prices except to scan goods in a store and see that you can get it cheaper on Amazon. RedLaser, a wildly popular iPhone app, has only recently been available on Android. It’s quite polished and the user interface is really nice to use; they’ve clearly put some thought into everything from the graphics to the button layout. For example, minor navigation buttons are located at the top of the screen and the Scan button is located at the bottom of the screen. Thus if you’re scanning a bunch of stuff in a hurry it’s super easy to use your thumb to keep scanning—no awkward hand shifting or grip required. RedLaser also prominently displays the lowest online and local price at the top of the search results for instant comparison. The barcode scanner in RedLaser is snappy. It’s not quite as fast or aggressive as the one in Google Shopper but it’s miles ahead of the scanner in Price Check. It’s just the right balance between rapid focus/snappy lock and the disconcertingly fast scan and lock you get with Google Shopper. We had no complaints. When using the scanner you didn’t even need to really attempt to line it up; while scanning the Wii game, for example, we focused it on the center of the box with barely a sliver of the barcode visible and it still snagged the information. While you can use text and voice search in RedLaser, those two features are tucked into a sub-menu. RedLaser is strongly focused on quick one-touch barcode scanning. Verdict: If you’re looking for a fast loading app that will get you scanning and comparing almost instantly, RedLaser should be your first choice. The time from application launch to first scan is unsurpassed by any other apps in this roundup. 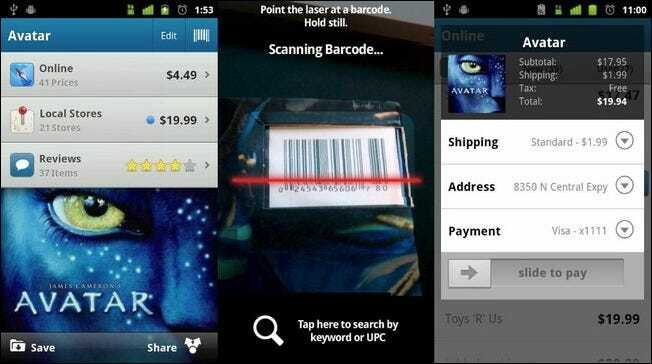 ShopSavvy is one of the most downloaded barcode scanners on the Android market and rich with features. Some of them, arguably, are a bit useless–like the live-feed of scans happening near you, do you really need to know that somebody in your town just bought Strawberry Shortcake dolls? ShopSavvy’s barcode scanner was by far the most lackluster of the bunch. It often stuttered, for lack of a better word, on the focus. If it didn’t nail the focus the first time we were in for at least 3-4 seconds of fruitless refocusing. It’s clearly not a phone problem as Google Shopper’s so-fast-it-hurts scanning algorithm demonstrates. ShopSavvy has a wallet system which you can use for speedy purchasing but, since many people likely already have a Google and Amazon account set up for purchasing, it lacks the punch it would have if the market weren’t saturated by other price comparison heavyweights. ShopSavvy does include a folder organization system for saving items which, while completely functional, lacks the ease of export found in other solutions. Verdict: ShopSavvy was one of the first widely used barcode scanner applications in the smartphone world and has quite a sizeable following. We entered into our test of ShopSavvy expecting fireworks and ended up being disappointed in almost every metric. It’s a free app so go ahead and keep it in your arsenal for a backup comparison; we just wouldn’t rely on it as a primary tool. Have an comparison tip, trick, or app to share? Sound off in the comments with your Android-based comparison shopping solutions.